Brace yourself – this year’s festival is set to be one of the biggest yet! Whether you’re a teeny tot who loves to hit the dance floor or a grown-up adrenaline junkie, we’ve got a fun-filled, family-friendly program full of entertainment, music, activities and more. Catch world-class, record-breaking athletes water ski and wakeboard down the Yarra as they battle it out for the top prizes at the Moomba Masters comp. This one-of-a-kind sports event is your chance to see the best in water sports live and in action. 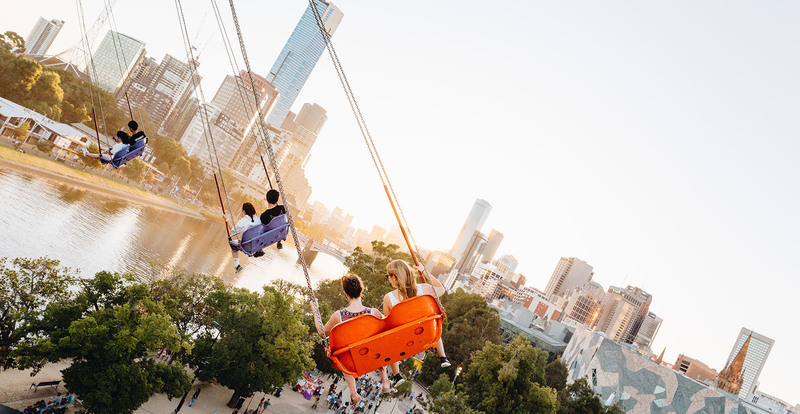 Once the sun sets on Moomba, we get ready to light up the night sky with an incredible fireworks display. They’re on every night of the festival so grab a spot, pull up a picnic rug and get ready to make some memories. See some of the country’s top skaters, BMXers and scooter riders jump, kick, flip and ollie as they compete for top prizes at the Skate Park. Want to give it crack? Experts will be dishing out tips at clinics so buckle up those knee-pads and head on down. Watch all-ages basketball teams battle it out on the NBL 3x3Hustle court. Hip-hop, R&B and everything party from this eclectic DJ. Flicks from talented kid movie makers. Get building or meet the stars of THE LEGO MOVIE 2. Create your own Jurassic World dinosaur. Smooth R&B from the winner of Triple J's Unearthed High Indigenous Initiative. See dare-devil circus performers reach dizzying heights. Tours depart every 30 minutes. Learn from the dance experts from Latin Connection. Powerhouse vocals featuring soul, jazz, blues and more. Smooth and catchy sounds from this budding budding singer/songwriter. Stories told through music and mesmerising vocals. Yorta Yorta, independent artist bringing music with a purpose. Accessible water skiing showcase with world-champion athletes. Make hanging sculptures in the sky. For kids aged 3 to 8. Catch these talented basketball teams battle it out on the 3x3Hustle court. Meet DreamWorks Trolls Poppy and Branch. A Yoga class just for kids. Come meet and take a pic with the banana-loving Minions Stuart and Kevin. A bubble show with bubble-lover Dr Hubble. Roving drumming from a crew of talented percussion artists. Learn new moves with Outer Urban Projects Dance Alliance. Make your very own space suit out of cardboard. Learn to hula-hoop, spin plates and juggle. Rock 'n' roll with a touch of country and soul. Soulful tunes with a Caribbean twist. A family-friendly and funky music show. Meet Home & Away stars Sarah Roberts (Willow) and Courtney Miller (Bella). A lively 7-piece band featuring Reggae and Ska. Catch this popular Melbourne indie rock band. An indie-folk band just for kids. A high-energy musical safari to get you up and dancing. Learn the rules of 3x3 and try your luck at the two point shoot out. Learn contemporary, disco and funk. A big band sound straight from Melbourne. Grab three or four mates and register for the day's 3x3Hustle tournament. Catch this singing sensation from The Voice pre-Birdman Rally. Get crafty and make a Toothless dragon mask. Catch roving drummers as they bring the beat. Be a part of the 3x3Hustle action. Be sure to sign up from 10am – 2pm. High-energy bluegrass and fiddle tunes. Catch the best scooter riders at this must-see competition. Learn new dance moves from Super Mande Percussion. Learn the rules of 3x3 basketball and try your luck at the two point shoot out. Meet My Kitchen Rules stars Pat Calleja and Bianca Braun. Soulful music infused with funky Afro-beats. Featuring dance hall, break dance, hip hop and more. A family bush dance romp. An eight-piece soul, RnB and funky fem-hop outfit. Big horns driving rhythms and punchy vocals. A music melting-pot of funk and worldly beats. Catch pro-basketballers play on the NBL 3x3Hustle court. Learn from the drumming and dance experts from Wala. Let Dr Hubble take you on a journey into the wonderful world of bubbles. Afro-Brazilian percussion and Mexican folkloric ballet. An eight-piece Balkan brass powerhouse. Snap a selfie with the best of the best basketball players. Catch the in BMX at this must-see competition. Head to the NBL court and level-up your skills. All are welcome to join in! Acclaimed Indigenous vocalist and Melbourne rhythm combo. Iconic reggae ensemble with fresh rhythms. Epic dance-pop music to get you off your feet. Learn from the experts from Outer Urban Projects Dance Alliance. Electronic sounds with Afro-Latin beats.